The California Air Resources Board (CARB) recently released a report recommending actions to improve emergency and routine air monitoring at California’s major oil refineries and surrounding communities. The report, authored by CARB and the California Air Pollution Control Officers Association (CAPCOA), is part of a broader initiative to address refinery safety and emissions in response to a major refinery fire in 2012. The fire raised concerns related to refinery maintenance and safety, and emergency preparedness, at and near California’s oil refineries. Improve state and local coordination through an interagency refinery monitoring working group. The report also recommends first responders have access to improved air monitoring tools and data and be thoroughly trained to apply them. CARB says that actions recommended in the final report aim to strike a balance between local implementation of stronger air monitoring and communication systems, and state oversight. A proposed interagency working group, which would be comprised of staff from CARB and local air districts, would develop guidelines that air districts use in requiring refineries to expand air monitoring networks and making the data available to first responders and the public. CARB also noted that the refinery-focused guidance could serve as a future template for similar air monitoring around other types of industrial sources that pose a risk to nearby communities. 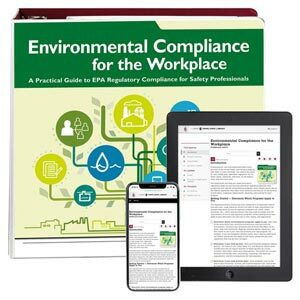 J. J. Keller's Environmental Compliance for the Workplace Manual addresses major environmental issues, including permitting, planning, and training.